Confused about how exactly sales funnels work? You’re not alone. 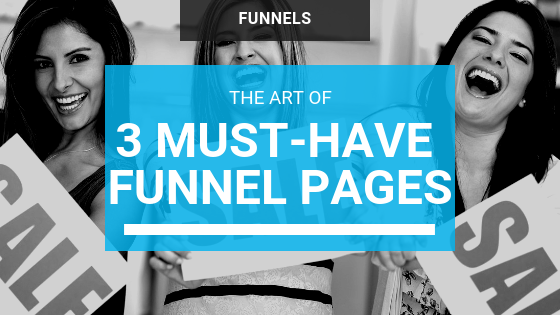 In fact, that’s the number one reason small business owners say they can’t get their funnels set up—they simply don’t know what to include where. This one obviously comes first. You might call it a landing page, or in the case of a free opt-in, a squeeze page. It serves one purpose—to get the reader to take action. Whether that’s to buy a product or offer up their email address in exchange for a free gift, this is the gateway into your funnel. Simply address the readers’ pain points and how your offer provides the solution. Here is where you can offer an upsell, remind people to follow you on social media, and give them a peek at your other products and services. This is where they actually collect their downloadable item or get information about how your product will be delivered. Like the confirmation page, this is valuable real estate, so you want to be sure you use it wisely. In addition to the downloadable item your customer just purchased (or opted in for) you also want to showcase your other offers—especially those at a slightly higher price point. A limited time offer ( also known as a one time offer or OTO) —scarcity sells, so if you can legitimately limit sales to a few minutes/hours/days or a number of units, then this is the place to do so. A “no brainer” coupon offer—an insider’s only deal can be a powerful motivator, especially if it’s a fantastic price. Extra bonuses—give them access to additional products/services if they buy through your link on that page. These should be bonuses that aren’t advertised on the public sales page for that product. Again—insider’s deals are motivating! Putting together a sales funnel isn’t complicated—or at least it doesn’t have to be. As your business grows and you have more products to offer, you can expand your funnel to include more upsells and downsells, but for now, this simple setup is really all you need to get started.